The following definitions are given by the United Nations Economic Commission for Europe: Combined transport is intermodal transport where the major part of the European journey is by rail, inland waterways or sea and any initial and/or final legs carried out by road are as short as possible. Accompanied transport, also known as "rolling road". Unaccompanied transport, changing from one mode of transport to another using a purpose-built terminal (road, maritime, waterway, rail, air). Intermodal transport: The movement of goods in one and the same loading unit or road vehicle, which uses successively two or more modes of transport without handling the goods themselves in changing modes. By extension, the term intermodality has been used to describe a system of transport whereby two or more modes of transport are used to transport the same loading unit or truck in an integrated manner, without loading or unloading, in a door to door transport chain. For more information, please visit the UIC Terminology section or the UNECE website. Lorries make it possible to provide a door-to-door service, as they cover the short distances separating factories and terminals. They enable the major advantages of road haulage to be tapped, i.e. a network that reaches further and is denser. Containers lead to better logistical management of the areas used for loading and unloading goods, since their rigid structure enables up to six of them to be stacked in one pile. Container lengths have been standardised at between 20 and 53 feet. Swap bodies are standardised loading units equally suitable for carriage on road vehicles or railway wagons. As they can be used in a broad range of situations, are simple in design and inexpensive, this form of conveyance has been highly successful and is currently one of the most widely used transport systems on the market. While semi-trailers are more costly and heavier, their advantage is that they can be coupled directly to a tractor and do not require a road chassis, unlike containers and swap bodies. Terminals are interchange hubs between rail and road traffic. They are fitted with all the equipment required to handle and tranship loading units from one transport mode to the next in a rapid and efficient manner: gantries and mobile cranes, modern computer systems integrating tracks, storage areas, transhipment areas and connections to roads and motorways. There are a plethora of different wagons available for combined transport purposes. Those most commonly used for rail-road combined transport are flat wagons, fitted with scotching systems for swap bodies and containers, as well as base plates for swap bodies. Wagons used to carry semi-trailers have very low floors and recesses to accommodate the wheels. The rolling road concept is the only option available to shippers and freight forwarders to run combined transport services without committing to specific investment. Lorries are carried on purpose-built low-floor wagons, while drivers travel in seated accommodation or couchettes. Transhipment between road and rail takes place at terminals, using mobile ramps, with the lorries subject to specific conditions resulting from the category and clearance gauge of the line worked. Rolling road services are limited to set routes. Owing to the particular requirements associated with the purpose-built wagons used, there are no plans to introduce this option for wagonload traffic. Short-sea: This is transport by sea over short distances, for example between Great Britain and the continental ports of the English Channel and the North Sea. Deep-sea: This is transport by sea over long distances, sometimes between continents, for example between Asia and Europe. Ships carry transport units by sea between different ports. They can vary considerably in size depending on the distance to be covered and the volumes to be transported. 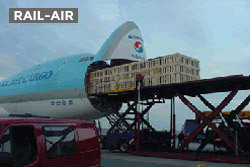 Most of the time they sail on set routes arranged by the shipping companies and shippers. In the case of deep sea shipping, they only carry "sea containers", complying with the technical features stipulated in the ISO standards in force. In the case of short sea shipping, some companies also accept transport units such as swap bodies (with or without road chassis) and semi-trailers (accompanied or not). Containers lead to better logistical management of the areas used for loading and unloading goods, since their rigid structure enables them to be stacked up to three high. Container lengths have been standardised at 20 and 40 feet, making them the ideal transport unit for sea shipping. The wagons used for rail-sea combined transport are flat wagons, fitted with scotching systems for containers. Port terminals are, naturally enough, located in sea ports. Their infrastructure generally enables them to handle both road-sea traffic and rail-sea traffic. They have one or more quays where ships can moor, with railway tracks running parallel to the quay so that loading units can be transferred directly from ships to wagons and vice versa. 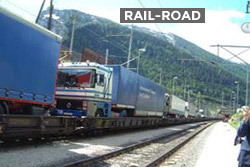 Rail-barge transport is very similar in terms of the way it is managed to rail-sea transport. However it is different from the latter in terms of the market segments it serves. Unlike sea shipping, transport by inland waterway is a way of linking industrial centres which have a sea and/or waterway port, on a single land mass. 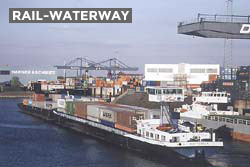 Where such inland waterway terminals are connected to the railways, volumes carried in intermodal rail operating programmes can also be carried by inland waterway and thereby collected from and distributed to the main industrial centres in Europe. Barges are shallow-draught boats equipped with a platform on which intermodal transport units (containers and swap bodies) can be carried. Swap bodies are standardised loading units equally suitable for carriage on road vehicles and on railway wagons. As they can be used in a broad range of situations, are simple in design and reasonably priced, this form of conveyance has been highly successful and is currently one of the most widely used transport systems on the market. 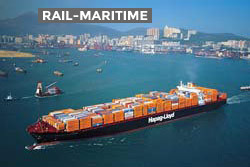 Swap bodies cannot be used in combined rail-sea transport but they are sometimes used in transport by inland waterway. The wagons most commonly used for rail-waterways combined transport are flat wagons, fitted with scotching systems for swap bodies and containers, as well as base plates for swap bodies. Wagons used to carry semi-trailers have very low floors and recesses to accommodate the wheels. Inland waterway terminals are located at the heart of inland ports, the latter are interlinked by waterways such as rivers and canals. Their infrastructure generally enables them to handle both rail-road traffic and rail-barge traffic, for that reason they are often called "trimodal terminals". They have one or more quays where barges can moor, with railway tracks running parallel to the quay so that transport units can be transferred directly from the barges to wagons and vice versa. Because freight forwarding is concentrated among international transport integrators and logistics firms, airports are increasingly setting up Cargo Centres as multimodal hubs. The spread of cabotage in the wake of rapid expansion of air cargo traffic cannot be absorbed by road transport alone and rail transport offers an effective alternative to road congestion, especially between airport Cargo Centres and distribution platforms. Combined Transport presents a range of benefits. It contributes towards a better quality of life and proposes a seamless transport solution in order to improve the productivity of the entire chain. The “2014 Report on Combined Transport in Europe” is the fifth in this series. It was researched and prepared on behalf of the International Union of Railways (UIC) by BSL Transportation Consultants GmbH and provides a thorough insight into the combined transport industry in 2013. In addition to the market information featured in previous editions (market structure , volumes per market segment, country O-D matrix of transport volumes, market outlook), the 2014 edition of the Report includes some of the significant changes afoot in the European railway environment, such as the implementation of the Rail Freight Corridors and the revision of Directives 96/53 and 92/106 as they form a general framework which will undoubtedly enable the combined transport sector to sustain the growth it has been enjoying in Europe for the past decades. The Report also includes spotlight analyses on the development of the hinterland market and seaport activity, on combined transport terminals and on national measures in support on combined transport. In combined transport, the higher sections of most ITUs (Intermodal Transport Units) foul the loading gauge in various European countries when the units are loaded on wagons or bogies. Their carriage must therefore be covered by the procedure for exceptional consignments as per UIC Leaflet 502 (International Union of Railways). In order to facilitate and speed up transport in a reliable manner, a coding system for various elements of combined transport was established. The system ensures safe operation of ITUs, indicates their loading gauges and ensures the owner is identified. UIC Leaflet 596-6 sets out the prescriptions for this system regarding ITUs, carrier wagons and lines. various companies in the combined transport chain. Those who do not wish to apply the UIC 596-6 procedure have to take organisational measures which ensure the same level of reliability. In its White Paper, the European Commission spoke of an increase in intra-European transport, all modes included, of 38% in ten years time. It also mentioned a growth in the rail freight’s market share of around 8 to 15% to the year 2020. To meet this challenge, a large number of railway companies has adopted an aggressive strategy where intermodal transport plays an important role. Contrary to the general trend of rail freight, rail/road intermodal transport more than doubled between 1986 and 2000 - attaining 180 million tons. These figures show that in order to absorb the growth announced in the White Paper and for railway companies to be able to propose adapted and competitive products it has become vital to have sufficient infrastructure capacity. That is why UIC’s Combined Transport Group has decided to commission a study to identify the measures to be taken by transport industry players (government authorities, railway companies, operators, infrastructure management). This is particularly important in terms of investment, to guarantee our share of the intermodal business.